Congratulations to all the students on a stellar Winter Music Program. 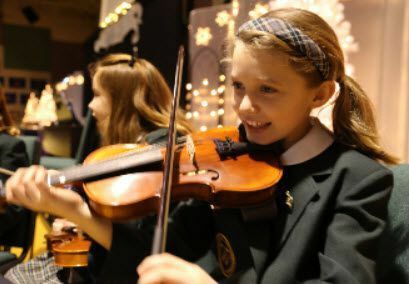 Set amid a winter wonderland, the orchestra and the children provided a musical treat for the entire audience. It was a pleasure to prepare for the winter show, and all the students were excited to practice and ultimately perform. During the second quarter, students in Kindergarten learned about music dynamics and rhythm using the Orff instruments. The Orff approach to music is based on the idea that each child can learn music, and that the instruments should be simple, basic, and natural — which, of course, aligns itself with the way children learn. Students were very excited to continue to learn about music dynamics, which center around how loud or soft music notes can be. They studied this concept through stories with no words, which helps them appreciate how music can create images and feelings without using words. A time signature tells you how music is to be counted. It appears at the beginning of a musical score. The second-grade students are learning about this musical skill as well as rhythmic patterns. Building upon their previous music lessons, the third graders are now learning more about music reading and playing. They are beginning to master Solfege, which is used to teach pitch and sight singing. Playing the recorder is a Westminster tradition, and the fourth-grade students just finished their recorder unit with much success. They were able to play almost the entire “c” scale, and they sounded wonderful during the Winter Music Program. The students increased their experience with the recorder, having successfully played the entire “c” scale, “f” scale and “g” scale. How impressive it was to hear them perform a three-part Carol of the Bells! Continuing to work on their music appreciation and singing technique, the sixth graders studied various styles of music, including the oratorio and various composers of the Baroque period. In addition to studying Baroque and this wonderful time in history, the seventh-grade students are working on their breathing techniques and solfeggio. Solfeggio is a voice exercise in which runs and scales are sung to the same syllable(s), training the voice for greater challenges. As a great culminating unit, the eighth-grade students reviewed all the musical periods from the medieval to the Modern Period. They also focused on breathing techniques and solfeggio.